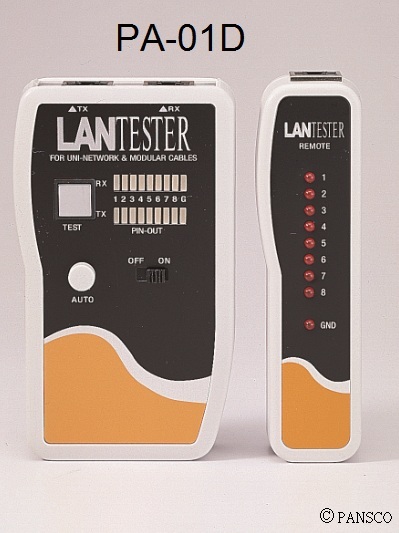 The LAN cable tester is a versatile, full-featured tool for testing many kinds of network cable. Loopback and remote tests may be performed automatically or manually, and will test cable continuity as well as identifying opens, shorts, reversed wiring, and miswiring in cables up to 2,000 ft. long. Shielded connectors allow the tester to test shielded twisted pair (STP) cables. The built-in tone generator generates a low emission frequency tone which can be detected by any market tone probe, making it easier to trace and locate cables. Uses 1 9V alkaline battery. CE Approved. Includes remote terminator for testing already-installed cable. Identifies opens, shorts, reversed wiring, and miswiring in shielded or unshielded cables. Tests cables up to 2,000 feet long. Automatic and manual cable testing. Built-in tone generator transmits a tone on any pin or all pins. 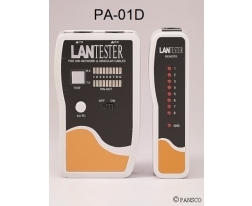 Comes with RJ45 to RJ45 patch cord and adaptors for testing 10 BASE-T, EIA/TIA 568 A/B, AT&T 258A, 100 BASE-TX, TOKEN-RING, TP-PMD, ISDN, USOC and BNC networks. For continuity, detects, opens, shorts, reversals, crossed and misswires.